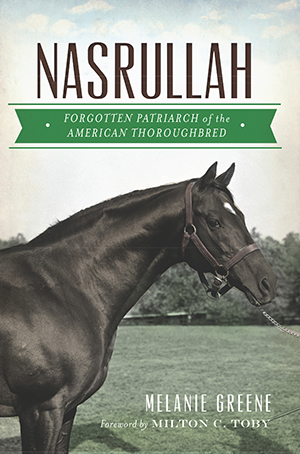 Nasrullah arrived in Kentucky in 1950 and forever changed the modern American thoroughbred. Bred in royalty by the Aga Kahn, Nasrullah's journey from Europe to America was one of glorious victories and grand potential. He was the first horse to lead both the American and English sire lists, which led to a legendary line of descendants that includes nine U.S. champions, three Hall of Famers and ninety-eight stake winners like Bold Ruler, Noor and Nashua. Nasrullah is even grandsire of the famed Secretariat. Ride along with author Melanie Greene as she recounts the compelling history of a truly remarkable horse that is sure to take any equestrian fan beyond the bluegrass. Melanie Greene is a lifelong equestrian and horse racing enthusiast. She has worked at stables, conducted riding lessons, and competed for her university's equestrian team. Greene has also completed academic research in equine science. This is her first book. Milton C. Toby is an attorney and History Press author of the award winning Dancer's Image and Noor. He has published multiple titles on equine law and business for Blood-Horse Publications and has been a writer for The Blood-Horse magazine since 1972. Additionally, he has published articles with Kentucky Monthly, and The Thoroughbred Record.